Care Oil for maintaining KREIDEZEIT Stand Oil Paints or tinted Wood Lazures exteriors. Restores the protective qualities and original colour of weathered surfaces that have become dull and pale. Application on windows, doors, wooden facades, timber frames, playground equipment, car ports and much more. In order to maintain the protection and appearance of your wood, we recommend to regularly inspect, care for and maintain your wooden surfaces – it’s easy to do and means you will have to re-paint less often. KREIDEZEIT Care Oil does not contain any solvents or water, and consists exclusively of natural oils. It contains no ‘hidden’ alkyd resins produced from non-drying oils such as rapeseed, soybean or sun-flower oil. Shake product briefly before application. Processing and drying temperatures: at least 10°C for a minimum of 48 hours. For areas that have lost their shine, use Care Oil rubbing very thinly with a soaked cloth. Then after 10 minutes, wipe the surface with a dry cloth until a uniform silky-glossy appearance is achieved. Do not touch up glossy areas (risk of greasy, sticky surface)! Dry and re-coatable at 20°C and 60% relative hu-midity after approx. 24 hours. High humidity and cold temperatures significantly extend the drying time. Hardened after approx. 4 weeks. Clean immediately after use with Balsamic Turpentine and then with Olive Care Soap or Corfu Soap. Visually check coated surfaces at least twice a year for impurities and damage. KREIDEZEIT Wood Lazure and Stand Oil Paint are environmentally-friendly and are intentionally non-fungicidal. 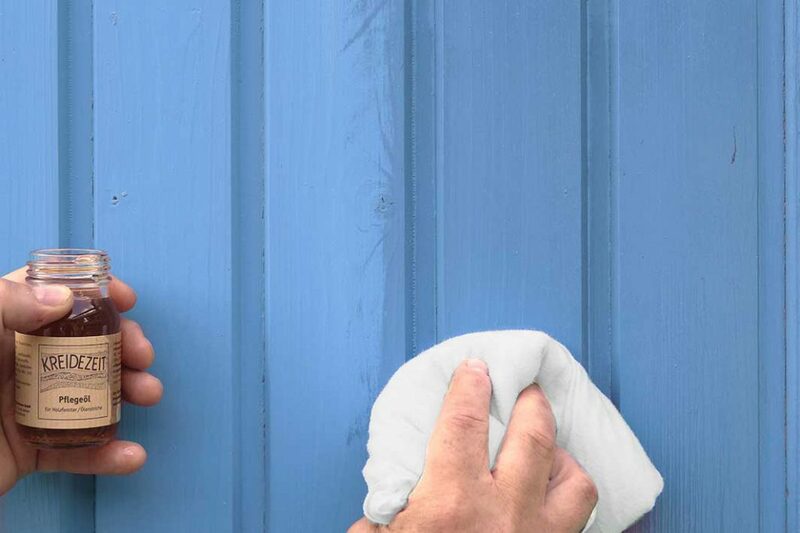 Therefore, it is vital to inspect external surfaces at least every six months for fungus caused by condensation, which usually starts with small black spots; remove these immediately with water and soap. For light dirt, clean only with lukewarm water without any additives. For heavier dirt, clean using Olive Care Soap or Corfu Soap. Very stubborn dirt can be removed beforehand with a scouring pad, abrasive cloth or sand paper (P100). Not recommended for use on inside surfaces of cupboards; these are best treated with Shellac Varnish, Carnauba Wax Emulsion or Corfu Soap.